Letting go of velociraptors is easy; letting go of fear (and your favorite pair of pj’s) is hard. Or so I thought. I have noticed over the month (of extending love to guilt) I have been feeling a growing letting go energy. It feels like a flow of spaciousness that just IS. I noticed it first when talking to my daughter about wanting to get a new sofa and dining chairs. I am realizing I am ready to let go all kinds of stuff that I have previously clung too as my life and identity. I asked Holy Spirit how I can remain open to this energy. Thank you for noticing this new energy. Simply continue to notice, allow and be guided by its flow. It will not overwhelm or devastate; it will simply facilitate the desires of your heart. The letting go is also letting go resistance, fear and doubt. You have given this order deep within your being, do not fear the shifts, changes, and open space created. This is all for your dearest most personal benefit. You can be assured your brother is automatically benefitting. HS: Let one new thing go each day for 30 days. Ask yourself what you have been afraid to let go of. Let one new thing go each day for 30 days. 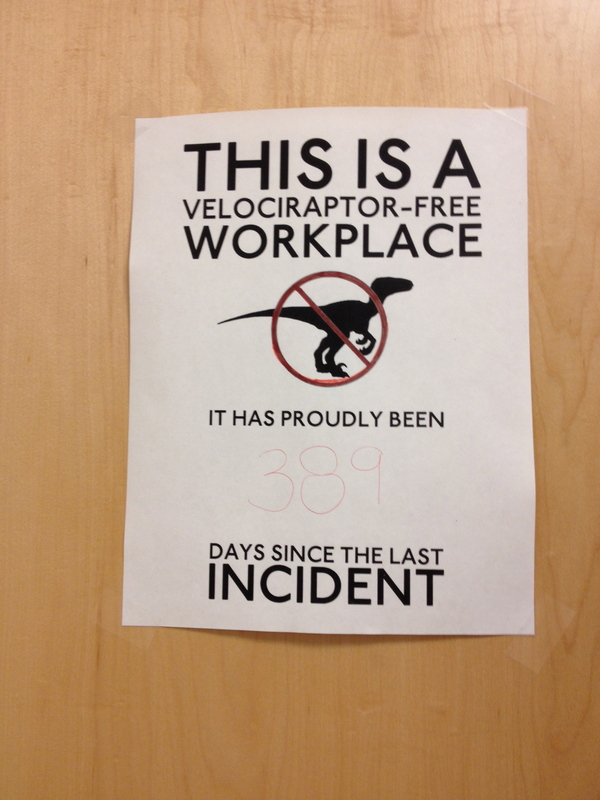 I can let go of velociraptors. I can see that even while I resist letting go mightily (I am naturally and completely loyal; to people, nations, shoes, and my favorite biscuit) I have let go of some pretty big things: my Mother, the USA and Australia in turn, How I saw God, being an actress (was accepted to ACT in San Fransisco but had an early, powerful experience with trusting my inner guidance that said “I would end up not knowing the difference between acting and real life”. It is still a problem actually…. ), and last but certainly not least, coffee. I am not as suspicious of letting go as I used to be. But I think that actually feeling the letting go energy before HS directed me prepared the way. Good grief, I can’t even say “hang on tight” because I am being asked to practice letting go so LET GO and let God people! This is going to be in interesting month! Let’s LET GO together……….What are you ready to let go of? I am practicing letting go of the illusion of control. My house has been “for sale” since Thanksgiving 2013. We have a deposit on a luxury apartment, contingent on the sale of our house. My husband and I have a deadline of the end of this month when the contract expires with our real estate agent. We have been excited about the move that might happen, and yet have come to peace with the possibility that we will take the unsold house off the market at the end of the month, staying here for a few more years. It would be a win/win, either way being wonderful. Being in the space of not knowing which will happen is a feeling of let go, let God. It feels a little like floating. I’m in a not-knowing space, unsure about what the next few months have in store for us. Meanwhile lots of people are looking at our house and expressing interest. “Hey…show me the MONEY!” … or not….